Staying away from the Jackson, I am going with Gladys Knight and the Pips. The group consisted of Gladys, her brother Merald (AKA Bubba) and their cousins William Guest and Edward Patton. Yes, people forget they're cousins. :-) Happy OSF! Can't go wrong with Gladys. Great pick! A timeless and classic voice (that totally out shone her "cousins")! I had no idea that the Pips were related to Gladys - imagine after all these years not knowing that! Thanks! I interpreted the theme to mean actual family and went with a song, Heart and Soul - A musical family thread for over 40 years. LOL at Shae and hired singers! But excellent choice. I would love to see her in concert. I forgot about this musical "family." Great choice. I didn't know they were related! Good one! See. Gladys and Bubba. They were baad. Still are. Love this pick. Happy OSF! Ourstanding selection! The Pips truly benefited from having such a talented sister/cousin! I invite your blog readers to 'keep it in the family' with the sitcom family from Good Times. Can you say Dy...No....Mite! You know I love Ms. Gladys AND the Pips! Being as I am from Cincy, I think I might have picked the Isley Brothers. But Gladys and the Pips work for me too. 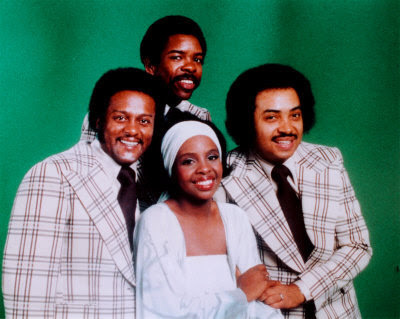 BTW, did you ever see the episode of The Richard Pryor Show where the Pips performed without Gladys Knight? Wow, all this time I had no idea they were an actual family of relatives! Thanks! I was on You Tube within the last month and watched this clip. I can't remember what led me to it... you know how it is with You Tube. I don't know if I told you before, but when it comes to my favorite version of "I Heard It Through the Grapevine", the one by Gladys Knight and the Pips is neck and neck with the Temptations' rendition.